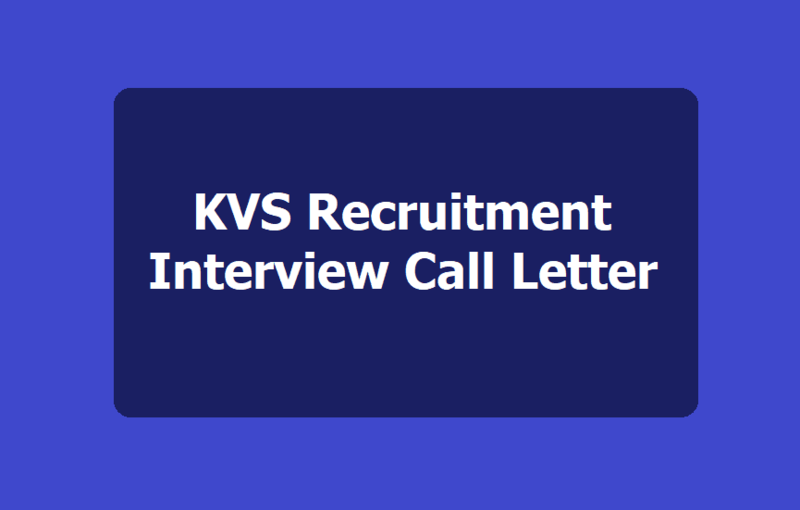 KVS Principals, PGTs, TGTs, PRTs Recruitment Interview Letter Download/ Kendriya Vidyalaya Sangathan Recruitment Interview Letter Download/ Download Interview Letter For KVSRE 2018 (PGT/ TGT/ PRT) Recruitment. Interview letters have been released for Kendriya Vidyalaya Sangathan Recruitment Examination 2018 (KVSRE 2018). The recruitment examination is being held for selecting candidates for the posts of PGT, PRT and TGT. Candidates can download the admit card from the official website of KVS at http://www.kvsangathan.nic.in/. Kendriya Vidyalaya Sangathan (KVS) has released the call letter for interview of librarian and PRT music teachers on its official website kvsangathan.nic.in. Candidates can login on its official website by using their registration number and date of birth. The exams were conducted on December 22 and 23 for recruitment in different Kendriya Vidyalayas across the country. Step 7: Download and take its print out. Based on the performance in written examination and also keeping in view the number of vacancies, the candidates will be called for interview. Intimation to this effect will be uploaded on the KVS website www.kvsangathan.nic.in in due course. Candidates are required to check the KVS website from time to time. Taking into account the performance of both written examination and interview, merit list will be prepared in case of Principal, PGTs, TGTs, Primary Teacher and Primary Teacher (Music), reads the official notification regarding the selection process of KVSRE 2018. The shortlisted candidates called for interview shall have to fill up the undertaking forms indicating choice/preference of the zones for their posting if they get selected and submit the same in hard copy at the time of interview. The undertaking forms shall be uploaded on KVS website "www.kvsangathan.nic.in" and CBSE webportal "www.mecbsekvs.in" along with the Interview Letter. The shortlisted candidates called for interview shall download the undertaking form along with the interview letter from the KVS website i.e. www.kvsangathan.nic.in. Please note that undertaking forms that will be handed over by the candidates at the time of interview shall not guarantee posting in a particular zone. The KVS reserves its right to post a candidate in a particular zone depending upon administrative contingencies. Candidates who are looking for KVS Admit Card 2016 they can get from online.